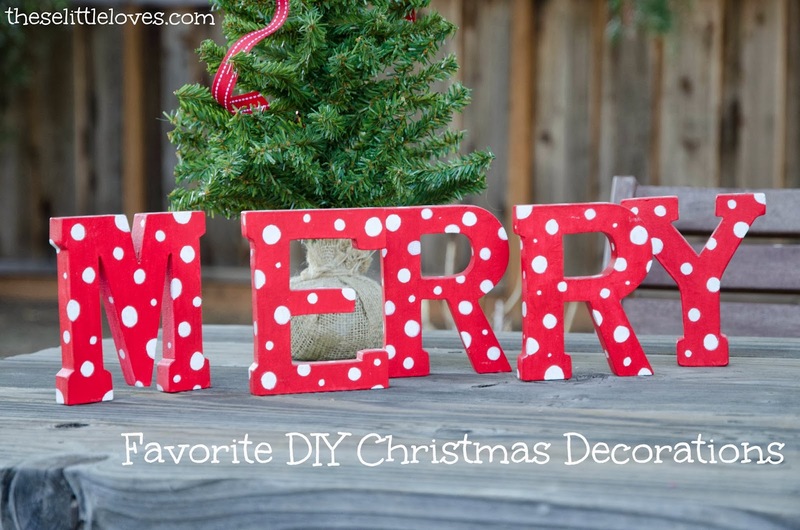 I'm always looking for a way to bring a little quick and inexpensive festivity to my home for Christmas. I like adding new projects each year, making our decorations something personal. 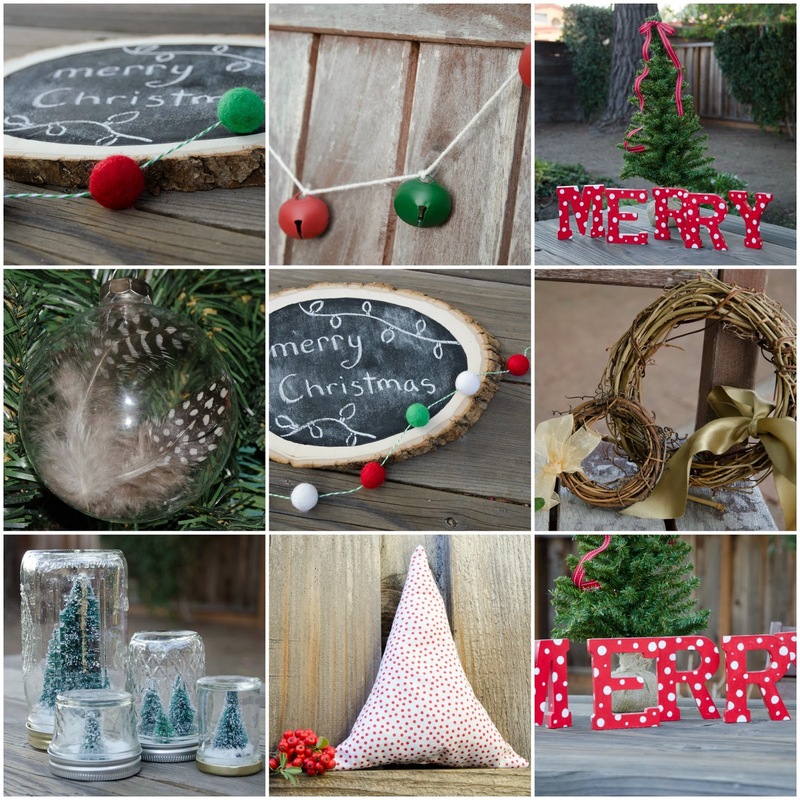 So in that spirit, here is a short roundup of my favorite handmade Christmas decorations. And why not wrap one of these little guys up and use it as a stocking stuffer or a party favor? Someone on my list is getting the mini wreath this year and we'll have to see if I can part with the felt ball garland. I might have grown just a bit too attached. Felt Ball Garland - Felt balls, baker's twine, needle. One of my favorite stores, The Makery in Los Altos, has a felt bar. This is the same idea as my cake topper from my husband's 30th birthday. Stringing a few of these felt balls onto some green and white baker's twine and you have an adorably simple Christmas garland. String it along a door frame, over a mantel, on the tree, above a mirror...I think I need to make more. Rustic Chalkboard - Round wood slice, chalkboard paint, paint brush, and chalk. This one isn't even Christmas specific - I think I'm going to keep this one up year round and change out the message:). Jingle Bell Garland - Jingle Bells, twine. About as simple as it gets and yet I have seen similar items for sale in the Pottery Barn magazine - crazy. Mine was a bit rustic, but if you go with a shiny jingle bell, I would suggest stringing it on a ribbon instead of the twine. Simple Wreath - Grapevine wreaths, ribbon. These wreaths come in all sizes. I like to keep them simple instead of overwhelming them with decorations. Just ribbons here. Feather Ornament - Glass ball ornament with removable top, decorative feathers. It feels ridiculous even to give instructions here. Open ornament. Insert feather. Close ornament. Mason Jar Waterless Snow Globes - Empty jars, fake snow, bottle brush trees and a glue gun. These were all over pinterest last Christmas (I think Anthropologie sold them). There are lots of tutorials out there, but all you have to do is hot glue a bottle brush tree to the lid and add fake snow to the jar. Painted Letters - Wooden letters, craft paint, paint pen. These probably took the longest of all the decorations, but I love them. I'm thinking about making more words in the future. You have to have a JOY, right? I found white wood letters, painted them with red craft paint, and then added polka dots with a white paint pen. Fabric Trees - Christmas fabric, thread, poly-fill, hand-sewing needle, sewing machine. These would be perfect for a kid's room. I think kids deserve a little Christmas in their room, too. I had a bunch more projects planned out, but life took over and they didn't get done. Oh well. Maybe next year!